Fortunately, Dr. Potter performs a range of procedures for patients in Hays, Kansas to successfully treat severe and mild acne scars. Dr. Potter will determine the severity of your acne and may select one or more treatments that are best for you. The basic steps of acne control may include topical antibacterials and antibiotics, oral antibiotics, comedolytics (such as Retin-A™), sebostatics (such as Accutane™), astringents and exfoliants. This study found that people with acne scars tend to be very introverted, often holding their heads down, covering their faces with their hair, and generally avoiding eye contact. Many of them carry a great deal of guilt — as if the scarring were their fault. Many sufferers “blame their skin” for things that go wrong in their lives. Dermabrasion is often recommended for severe acne scars and works well on both raised and grooved areas of the skin. The skin is first treated with an anesthetic, and the top layer of the skin is then “sanded down” with a wire brush or diamond burr. Seven to ten days later, the skin forms a new, smoother layer. Patients can expect full recovery in about 6 weeks. Microdermabrasion can be likened to a superficial “skin polishing” using micro-crystals vacuumed over your skin’s surface to remove damaged skin cells. These gentle treatments can provide noticeable improvement to acne scars. The treatments are progressive and are applied through a course of weekly sessions. Laser Resurfacing gives your physician precise control as the procedure gently vaporizes the damaged or acne-scarred skin to reveal the smooth, fresh skin underneath. Scars are removed in a precise, rapid, bloodless fashion achieving excellent results. Laser scar removal can be performed with local anesthesia if limited areas are treated, while full face resurfacing is usually performed with the administration of intravenous sedation by an anesthesiologist. Both procedures may be performed in your doctor’s office. With all of these procedures at our disposal, your treatment can be tailored to achieve your expectations. 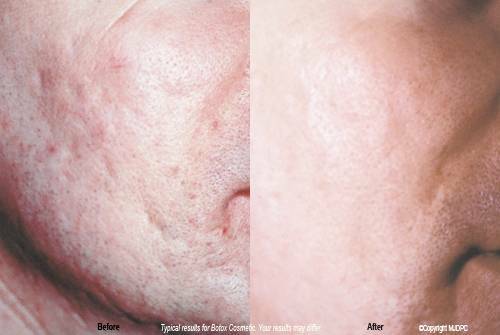 After Dr. Potter performs acne and acne scar treatments, patients are thrilled with the results.